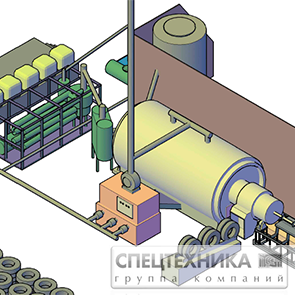 “SPECTECHNIKA” company will help you to start your own profitable business, main materials for which is free wearing-out tyres, those number increases every year. Why can’t you simple burn tyres? Firstly, while burning every ton of tyres 300 kg of soot and 400 kg of toxic gas get into the air. Secondly, at tyres recycling it is possible to obtain up to 700 kg of usable materials and energy, that are saleable at the market. Won’t you burn your own money? Get to know what the group of companies “SPECTECHNIKA” offers. Our company manufactures and supplies specialized equipment for quick and above all environmentally safe tyres recycling. To buy such plant is a profitable investment as for a small business as well as for a large enterprise, where one more production line is decided to be started. Not less than 4 ton a day of fuel oil, those characteristics correspond to stove fuel and it can be used for obtaining heat energy, as a material for diesel fuel and petrol. Not less than 4,2 ton a day of carbon black, which is used for fuel slugs producing, sorbents producing, as a colouring pigment, as a base component for various rubber goods producing. The group of companies “SPECTECHNIKA” will purchase from you the carbon black or will help in its selling. Metal scrap. Is used as a high-alloy steel for remelting and metal goods producing. We offer miniplant for environmentally safe tyres recycling, that is profitable in all respects: saving water usage, minimum atmospheric emission, free material base and state support. Call now, don’t miss your chance to get profit of 1 369 000 roubles a month.